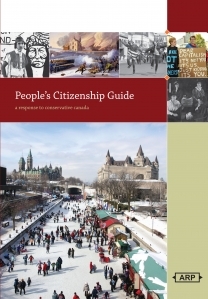 The new edition of this Citizenship Guide needs a more thorough review, preferably by a writer with knowledge of Canadian history or at least by someone who will investigate the background of the contributors (Granatstein et al.). As the husband of an immigrant who is preparing for her citizenship test, I feel the guide is problematic in two major ways. Firstly, it is dense and difficult to read, a collage of facts in tiny font. Secondly, it is highly militaristic in the way it celebrates Canadian war victories. However, the review does cut to the central problem with the Guide. It fails to inspire. Rather than inviting people to celebrate Canada, it tries to tell them how to be a Canadian. What a bore. Moreover, it is politically tainted. For example, it includes an odd segment on geologist Sir William Edmond Logan, founder of the Geological Survey of Canada, and namesake of the tallest peak in Canada. Though Logan might be respected for his geological acument, I suspect he is only included because, after the death of Pierre Elliot Trudea, (Liberal) Prime Minister Cretien attemped to rename Mount Logan as Mount Trudeau. If the Guide is intended as a rigorous “standardized citizenship test” then it will be understood that way by immigrants – as little more than a hurdle to overcome before getting on with the business of making a life in Canada.